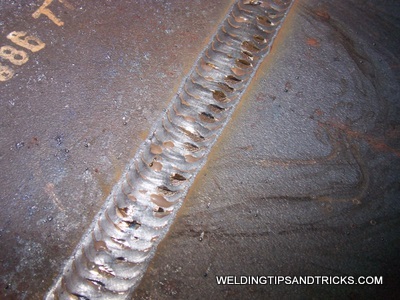 Mig Welding Tip #5...For MIG welding carbon steel, Use ER70S-3 for all purpose, economical welding. Or if you get a good deal on some E70S-4 thats good too. but you really dont always need E70S-6. Use ER70S-6 wire when more deoxidizers are needed for welding on dirty or rusty steel. There is no need to always use ER70S-6 wire. In fact, unless you metal is really dirty or rusty, I don’t think you need E70S-6 at all. I have never had problem with welding with ER70S-3 wire, even when the metal was not all that clean. So why does everyone recommend using ER70S-6 wire when welding ondirty or rusty steel? I think marketing might play a part here. Why should a wire with more silicon cost more? Do you know where silicon comes from? Silicon comes from sand. That’s right, Sand! Last time I checked, there was no shortage of sand, it is pretty cheap. There is no sand shortage. But saying E70s-6 wire will weld dirty metal implies a benefit. It implies that using it will save you money or time. or maybe less defects. It implies you will never have to clean the metal. You know what? Waffle house advertises premium steaks too. Are you getting a premium steak at waffle house? Its hype...smoke and mirrors.